Emotional Intelligence (EI) is, in essence, the ability to understand your effect on others and to manage that, and yourself, accordingly. Daniel Goleman’s findings, back in 1998, indicated that EI contributes 80% to 90% of the competencies that distinguish outstanding leaders from average leaders. This one-day institute will invite you to question how much does EI play a part in your own life and, ultimately, success in your school? Our work-life is full of challenges and deadlines which we are expected to meet. Problems caused by pressure, communication and an unclear vision can significantly hold us back. In addition, colleagues that we work with may lack confidence, feel demotivated and experience anxiety at times, and we may grow to anticipate and expect that this as “just part of life in a school”. But, as Tony will make clear, it is Emotional Intelligence that can make a real difference to our daily lives and the level of success and enjoyment we experience. Learn how EI fits in with the six styles of leadership. Understand the impact of EI on effective leadership. Assess your own EI with a questionnaire. Understand the actions of great leaders. Learn how to develop self-awareness, the first and fundamental building block of EI. Learn how to develop self-management, the second building block of EI. Learn what empathy, the third building block of EI, is and how to develop it. Learn how to lead and developing others, the fourth building block of EI. Discover the importance of active listening skills. Learn how to motivate effectively through autonomy, mastery and purpose (AMP). Learn about using the 4MAT system and KASH. Undertake self-reflection with the Carol Dweck questionnaire. Discover why having a growth mindset is important for academic and personal development. Leave with a whole-school approach to influencing the mindsets of students. Learn about the Rosenthal and the Pygmalion Effect. Learn about good and bad praise. Discover more about the language we use that is effective and priming impacts. Learn about operating your RAS, and impacting on the RAS of each student. Practise using mindset revealers – good, bad and modify. Learn why brain and mind matters, and what we as educators, and students, should know. Learn what the research says is the most important thing that parents can do. Take on board the locus of control (LOC). Learn how to be a positive classroom wizard. Understand the purpose of the training and what you want to get from it. Discover what coaching is and what it isn’t. Observe the spectrum of skills. Address the challenges involved in coaching in schools and how to overcome them. Explore Coaching Tool 1: The GROW model. Discover the benefits to schools of developing a coaching culture. It is critical for schools to move away from the many talent and IQ myths that presently exist and to stop categorising students in a way that damages their ability to grow and develop. 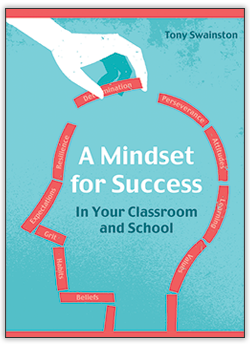 A Mindset for Success outlines key practical steps that can be taken in order to do just this, building instead a growth mindset culture in all classrooms and across schools. Crucially, Tony Swainston explains how a mindset for success can benefit everyone, giving more meaning to learning that, in turn, brings greater fulfilment for teachers and pupils. A Mindset for Success illustrates how grit, resilience and perseverance can be nurtured in every child, enabling them to take on the challenges of life and our changing world, which will lead them to greater academic success and personal happiness.